These bones are a perfect treat for your dog. These bones are the center of the leg, and have no big knobs or wasted weight. They are full of marrow which is good for their nutrition, helps keep teeth clean, and offers hours of satisfaction in chewing. It also helps puppies during the gnawing phase by massaging sore gums and help loose baby teeth. 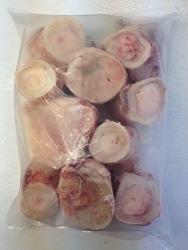 Keep bag frozen, bones can be given frozen or thawed but must be RAW! THESE ARE SOLD IN 5# PKGS ONLY, MUST BE PURCHASED WITH FOOD. GREAT TREAT IDEA!!!! When marrow is gone you can reuse bone and fill with Bone Appetit Raw Dog Food for a partial meal or treat, or add peanut butter and dogs favorite treat then freeze again. Great nutritious treat.